Oh no! Did they sell out quickly? I managed to grab some around 15 minutes after they went on sale, but I nearly forgot too. And I'm staying in London, around Clerkenwell! I'd love to meet up. I hope you can find tickets somehow! If not, there's always the Palladium gig. I assume it will be like a mix between how the 2012 concerts were and the 2015 5 hour long Roskilde gig. An eclectic mix of performers doing original songs, covers, whatever else. 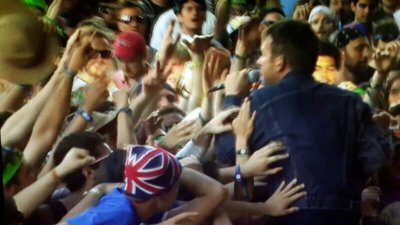 I'm hoping they'll do On Melancholy Hill like they did in 2012 https://www.youtube.com/watch?v=sXtqyEht2w4. And I don't think they're calling The Good the Bad and the Queen a "one off", I think it's just referring to the collective/event at large as a one off event. Has anyone seen any tickets available online through stubhub or some other resellers? My ticket already arrived. I know some folks who missed out and are still trying to get tickets, and just wondered if there’s been any luck amongst anyone on the forum yet! Good catch! First resell ticket I’ve seen thus far. So i heard right! They played Clover Over Dover for the first time ever!!! Wow!! This has gone far beyond that i've ever imagined, making me wish more and more i was there. I'm glad you've been there.